On Wednesday, September 13, 2017, the sun came out for three great North Carolina charities. 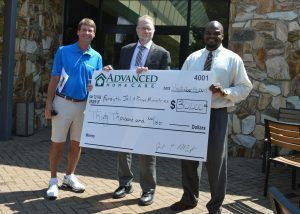 Advanced Home Care’s CEO, Joel Mills, presented $30,000 checks on the Champions Course at Bryan Park in Greensboro, NC, before a fun day of golf. The beneficiaries were Guilford Community Care Network, Forsyth Jail and Prison Ministries, and Alliance Medical Ministry in Wake County. 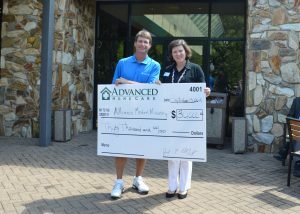 The generous donations were the result of Advanced Home Care’s 24th Annual Ch=arity Golf Classic and the generous sponsors. Advanced Home Care partnered with three of its owner health systems – Cone Health, Novant Health, and WakeMed – to selected the charities based on shared service areas. Guilford Community Care Network promotes and coordinates community-based efforts to ensure all persons have access to quality and affordable health care services in a comprehensive and coordinated system of care regardless of an individual’s ability to pay. The organization’s goals are accomplished through a network of doctors, agencies, and resources to provide medical and dental care, transportation, and assistance with food purchases. Forsyth Jail and Prison Ministries develops programs that empower offenders to redirect their lives so they may return to their community as responsible, productive citizens. The ministry’s objectives are accomplished through these core services: spiritual growth and discipleship; religious referral services; crisis and family counseling; substance abuse education; parenting classes; adult basic education assistance; family builder programs; and re-entry support and services. Alliance Medical Ministry provides comprehensive primary medical care to working uninsured adults in Wake County. These patients do not have Medicaid or Medicare and do not have private health insurance. Through a strong partnership with WakeMed, uninjured individuals who are discharged from WakeMed Hospital’s Emergency Department are referred to Alliance for follow-up care and to establish our clinic as their primary medical home. 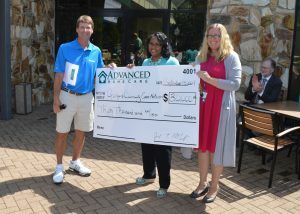 Representatives from the charities were thrilled and surprised by the donation and offered words of gratitude to all the participants and sponsors of Advanced Home Care’s Annual Charity Golf Classic. Advanced Home Care is a not-for-profit home health care agency that provides infusion therapy, skilled nursing, physical therapy, respiratory therapy, nutrition services, and medical equipment to 30,000 patients in their homes every day. One of the largest home care providers in the country, Advanced Home Care has 33 branches located throughout Georgia, North Carolina, South Carolina, Tennessee and Virginia, and is a joint venture of 13 health systems throughout these areas. Advanced Home Care’s corporate office is located in High Point, North Carolina. For more information about Advanced Home Care, visit www.advhomecare.org.